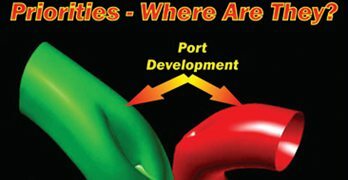 By now, I am sure you have a good idea of both the complexity and importance of the valvetrain, as this is the third consecutive chapter dealing with it. What I intend to focus on here is the practical application of what I have so far explained. 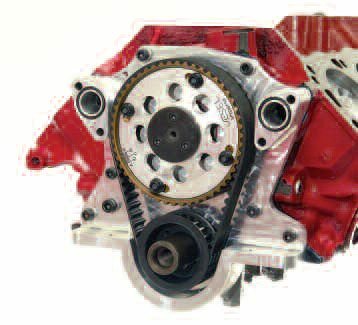 At this point, you should know what events and lift your cam and valvetrain should produce to meet the application requirements of your engine build. Although that is great progress, the job is far from done. Cam profiles are rated at a number of degrees at a certain lift. Depending on the type of follower to be used, cam profiles are rated at differing lift values. For instance, a hydraulic cam is rated in terms of degrees of tappet lift at 0.006 and 0.050. 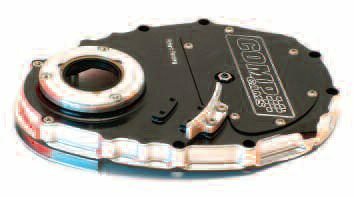 Some cam companies, such as Lunati and Comp Cams, also quote the cam’s degrees at 0.200 lift. Using these numbers, we can subtract the degrees at 0.050 from the degrees at 0.006 to determine how “fast” the profile is. The smaller the number between these two lift points, the greater the tappet acceleration and the higher its speed at the 0.050 point. This is known as the cam’s hydraulic intensity. The 0.006 measuring point is about the amount a good hydraulic valvetrain collapses due to component flexure, lifter leakage, etc. ; this means the degrees quoted are close to the duration seen at the valves. Knowing what is required in theory and applying it in practice are two different things. 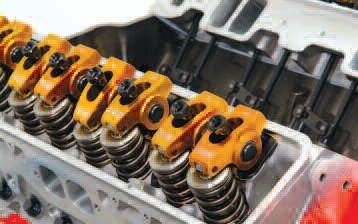 In this chapter I will look at the practicalities of assembling a high-performance valvetrain. 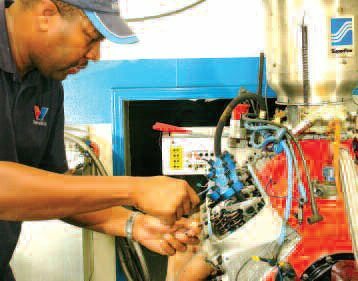 When the cam spec you require has been determined, you will find it much easier to make a choice from the cams listed in a manufacturer’s catalog because they could well have an off-the-shelf grind really close to what your engine needs. Assembling a really functional valvetrain is more than just selecting parts almost at random. Dynamic compatibility is paramount. The first move toward this goal is to select a top-quality valve spring. In much the same way, figures for a solid-tappet cam are quoted, but the primary lift mark is at 0.020 instead of 0.006. If all lash values, initial profile acceleration rates, and rocker ratios were the same, we could use these figures to determine the duration that exists after lash has been figured in. For some reason absolutely mystifying to me, the cam companies do not give us the duration at lash on a solid lifter. 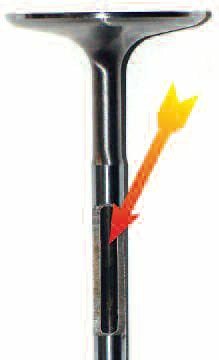 On top of that, many street profiles have the tappet lift quoted at 0.015 inches. What this means is that you need to make a guess as to what the real duration of a typical solid-lifter cam is at lash. If I am perusing a catalog, I make a provisional assumption that most cams rated at 0.020 are between 12 and 15 degrees longer at lash. Bear this in mind when comparing a solid profile with a hydraulic. 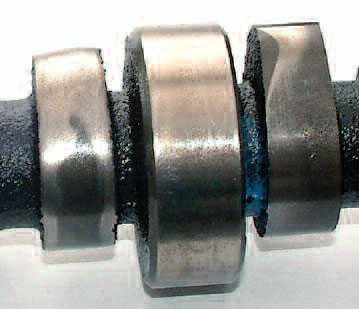 It may seem less than obvious at first, but a valvetrain can be no better than the valvespring that controls it. 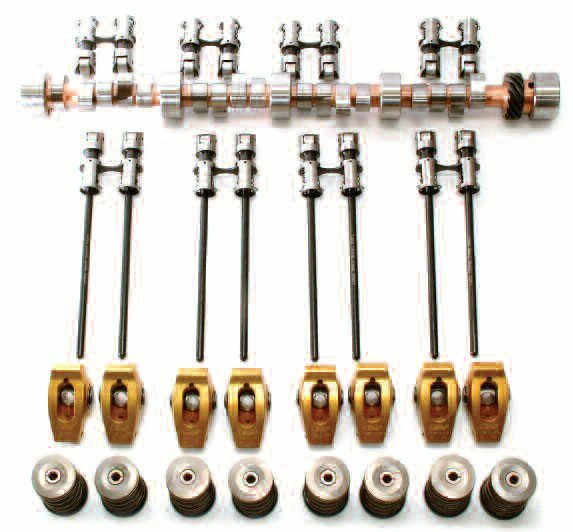 This makes the selection of the valvesprings for your engine of great importance. Just having the cam manufacturer’s recommended seat preload and over-the-nose spring poundage is only part of the equation. Since we are on the subject, the term so often used to describe the preload on a closed valve is “seat pressure,” but that is not the correct term. Pressure is pounds per square inch (like you put in tires) or load per unit area. We are dealing with load here, plain and simple, so the correct term is: “seat preload poundage,” or simply seat poundage. 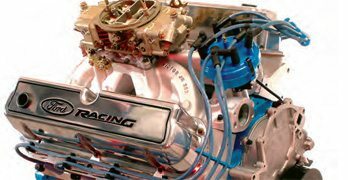 A big-block Chevy has a big, heavy valvetrain, so things need to be done right. The first two builds here used AFR ascast heads at 10.5:1 CR. The blue curve is for a 280 Lunati solid street roller. The black curve is for a Comp Cam circle-track grind with the same 280 degrees duration at 0.020 as the Lunati street roller, but with 2 degrees more at 0.050, 4 degrees more at 200, and about 0.050 more lift at the valve. The red curve is for a set of CNC-ported AFR heads, a 12:1 CR, and a Sniper intake. The cam was 298/309 at 0.020 and 0.800 net lift after lash. 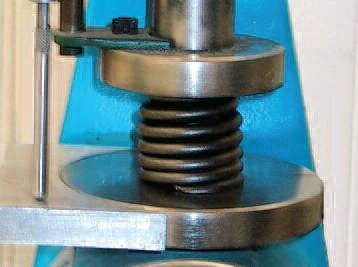 A heavy blow to the top of the spring momentarily compresses the top coils. This coil compression then travels back and forth along the spring’s length until it dies out. Note how the poundage exerted by the spring momentarily drops when the coil reflection occurs. A pushrod vibrates laterally. For the most part, this needs to be at as high a frequency as possible (via larger diameter and thinner wall thickness). Although, with careful tuning, this lateral flex can aid power by means of valve toss. 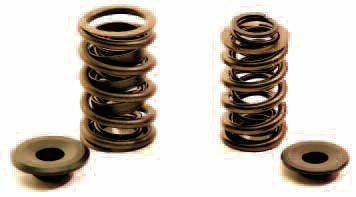 A spring’s stiffness is expressed in pounds per inch. A spring that has, say, a 250-pounds-per-inch rate delivers a force of 250 pounds for every inch it is compressed. Initially, we are going to be looking for a spring package that delivers the seat and nose poundage called for by the cam manufacturer. 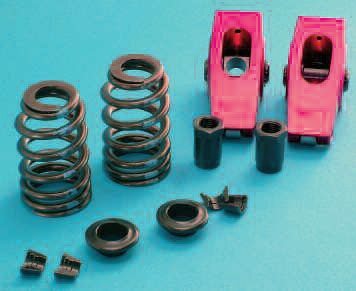 If we want to build as good a valvetrain as possible without resorting to the expense of hiring a Spintron, then the next step is to find a spring package that has the least mass. The way to look at this is that the spring has to use a certain amount of its valvetrain-closing force to return its own mass to the valve’s closed position. If the spring is heavy, then it has less remaining force to operate the rest of the valvetrain. There is also a little-known but immensely important fact known as the “resonant frequency.” When the principal valvetrain harmonic hits this frequency, it drives the spring into what is called “spring surge.” This uncontrolled motion of the spring is usually a giant power killer. Understand that valvetrains have components with their own resonant frequencies and, as such, there is almost always a cam profile motion frequency that is at or a multiple of one or other component. There are two ways in which we guard against these spurious vibrations from becoming a problem to motion control. 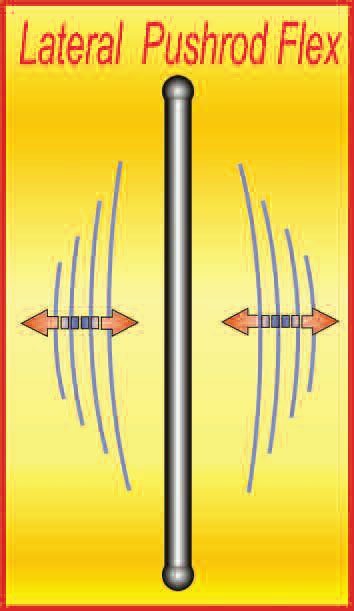 The first is to damp the spring, and the second is to use a spring package that has as high a natural resonant frequency as possible. That means selecting a spring pack with the minimum mass. The problem is, most cam companies, with the exception of Crower, don’t put the weight of the spring in their tech sheets. Your other alternative is to go directly to the spring manufacturer. PAC springs even go as far as quoting the resonant frequency of their springs. This company is a source I can recommend. 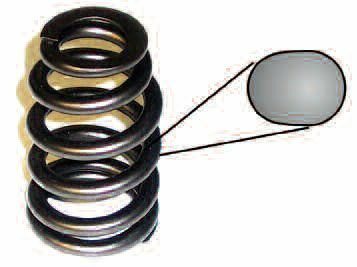 Not only is a spring required to contain and damp-out the frequencies at which it may vibrate, but to dampen the vibrations inherent from other components in the valvetrain. Of these, the pushrod can either be a source of severe hindrance or a power advantage. Where rules limit the tappet diameter (such as NASCAR’s premier Sprint Cup series), the amount of lift that can be put into the valve can be somewhat restricted. 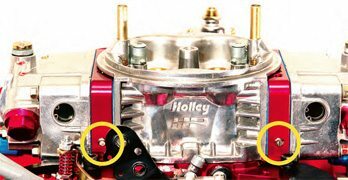 By tuning the pushrod flex, the valvetrain can, at high RPM, be made to “toss” the valve in a reasonably controlled manner. This extra lift is said to be worth as much as 20 hp. There are valid occasions when valve toss can be used in other classes. One example that comes to mind is when valve lift is limited by the class regulations. 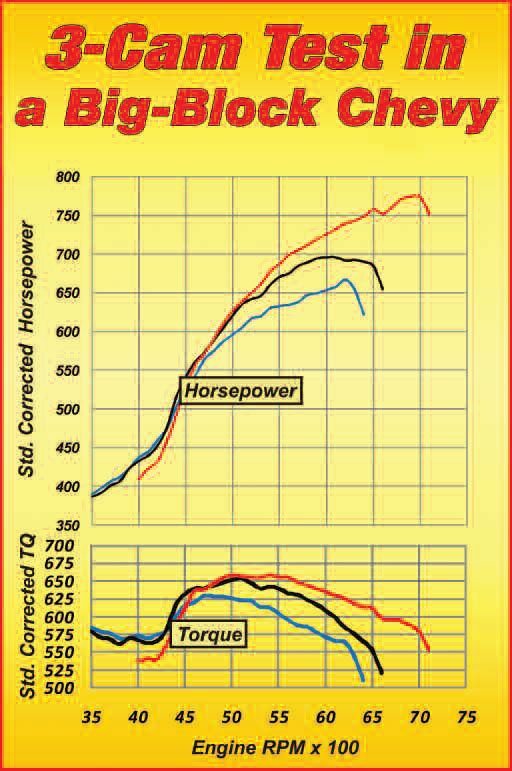 If the intake valve can be coaxed to 0.050 higher lift, there is most certainly a power advantage, as long as it does not subsequently bounce off the seat. Such valvetrains are somewhat specialized in nature and should be regarded as difficult to build without the precise input of Spintron data. Also, it is not a good idea for a roller valvetrain to go into any motion that deviates from the cam’s profile. 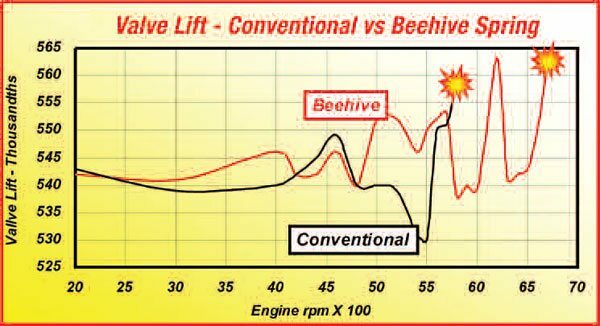 Although we tend to think of a valvetrain motion as being in a controlled manner all the way up the RPM range, until it reaches valvetrain crash speed, this is not always so by any margin. Spring surge mostly occurs at a speed substantially below ultimate crash speed; and when that happens, it causes a dip in the engine’s output at that RPM. The cure is to change the spring preload, natural resonant frequency, or damping. 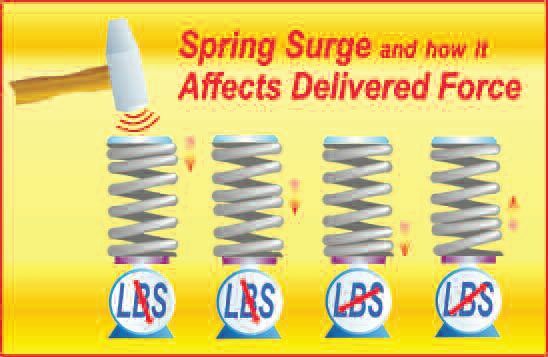 If the surge is minimal, shimming the spring to a higher seat preload can be a fix. The next option is a change to a lower-mass higher-frequency spring, and the last option is to change to a spring pack that has higher damping rates. We have not talked about damping yet, but the normal method of damping-out spurious vibrations is to introduce inter-spring friction either by means of a flat-wound damper between the inner and outer spring or reducing the friction of each spring (of a pair) with itself. These two springs exert virtually the same seat and nose poundage, but the one on the right from PAC is made of a superior material and weighs only 65 percent of the one on the left. This increased the RPM to valvetrain crash from 6,100 to 7,150 rpm. Before assembly, each spring should be measured and then shimmed at installation to give the desired seat preload. 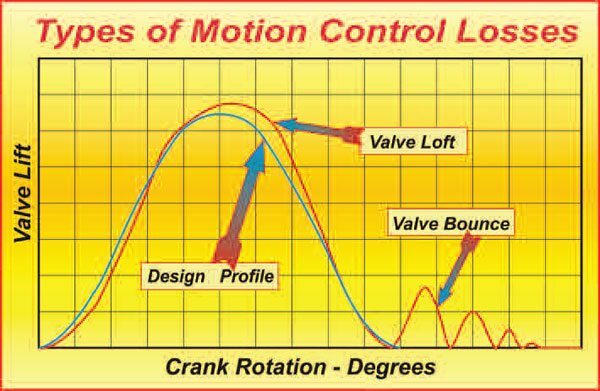 Here are the two principal types of motion that occur when the valvetrain no longer follows the dictates of the cam’s profile. Valve loft, or toss, can help power, but valve bounce is a power killer. Here is what valve toss and valve bounce look like on the scope while being run on a Spintron test rig. Valve bounce within the RPM range used has to be avoided if output at that point is to be preserved. Rockers produced from aluminum or stainless steel have a degree of internal damping. Such rockers, when paired with a functional spring, such as the beehives shown here, can produce a highly functional and wellbehaved valvetrain. Because they rely heavily on the changing of the natural resonant frequency to retain control, beehive springs are at their best when run close to coil bind at full lift. I have had excellent results in valvetrain dynamics by running these springs to within 0.015 inch of coil bind. A beehive spring’s function is much more complex than its regular counterpart. Top-grade beehives, such as this PAC item, not only have the obvious variable-wound coil but are made of an ovate-section wire to more evenly distribute stresses within the wire. These two springs were run on Comp Cams’ Spintron. The regular spring delivered higher seat- and over-the-nose poundage by about 12 percent, yet the beehive ran to more than 1,000 rpm higher before losing control. Since the turn of the millennia, beehive springs have become very popular with the performance community, and not without good cause. This type of design has the advantage that the changing pitch and diameter of the coils causes it to have significantly less of a clear-cut resonant frequency. As the spring is compressed, it seats one coil down upon the one below it. This causes the rate (stiffness) of the remaining active coils to increase, and the mass involved to decrease. By the time the spring is set to resonate at one frequency, the situation changes and another frequency comes into play. Since the spring goes through these frequency changes so fast, it has little effect on the spring’s overall performance. This sounds good in theory, but the real question for an engine builder lacking a Spintron machine is, “Does this really work?” The answer is yes and, these days, I use mostly beehives on any valvetrain for which I do not have time to get Spintron data. By going with the beehive spring, I am putting myself as far theoretically from valvetrain issues as possible. My advice here is: Regard a beehive spring as your number-one choice in the absence of really top notch expert advice to the contrary. Some of the data from Spintron tests I ran with the engineers at Comp Cams demonstrate just how well this type of spring can work. 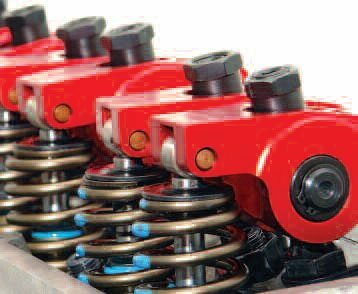 This type of spring is especially effective with a hydraulic cam; a lower preload can mean less hydraulic collapse during operation and less of a chance of lifter pump-up. 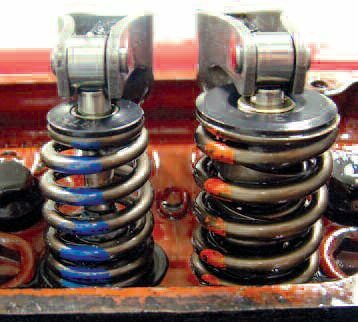 Because pushrods are intrinsically tied in with the spring’s performance, I’d like to mention a few things about them here. These days, intense Spintron testing has made pushrod design a highly focused science. Pushrods are not simply a steel tube, made of some reasonable grade of steel, with a couple of ends attached. The material, heat treatment, wall thickness, OD, and form (tapered or parallel) can make a significant difference between a so-so pushrod and a really good one. 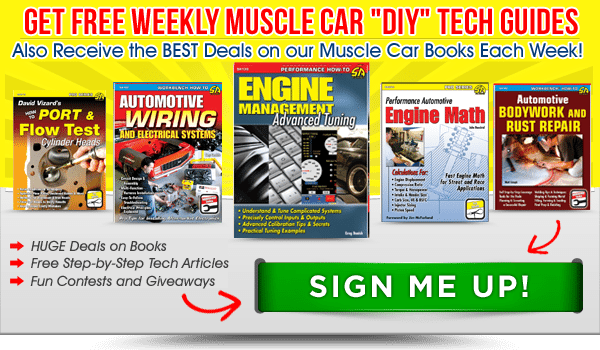 Unless you are doing little more than a rebuild with a mild cam change, my advice here is buy a good brand because it may well save you some difficult-to-diagnose dynamic valvetrain problems. It helps to understand the mode of function of a flat-tappet lifter. First, they are not flat. A flat-tappet typically has about an 80- to 100- inch radius on the face. Second, there is usually a taper on the cam lobe. Finally, with the cam in the installed position, the cam lobe does not wipe centrally across the tappet, but to one side. When working as intended, all these factors cause the lifter to rotate over half a turn during the lift event. This means the rubbing speed of the cam profile on the lifter is only a fraction of what it would be if no rotation took place. So that you understand the importance of this rotation, be aware that a regular cam won’t last 100 miles without rotation taking place. 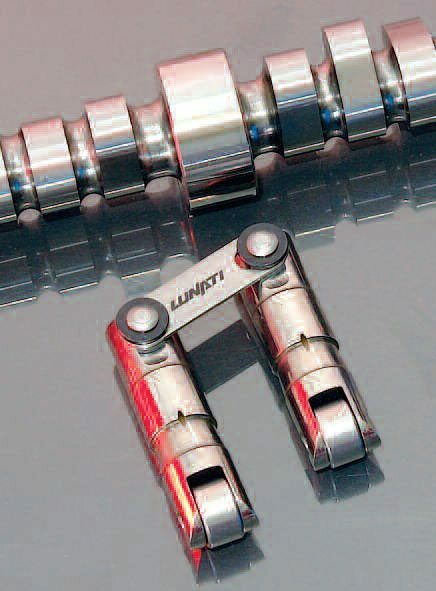 As added insurance against wear, some cam companies such as Comp Cams and Lunati offer a nitride hardening service for flat-tappet cams. My advice is: Pay the $100 extra and have it done—you won’t regret it. 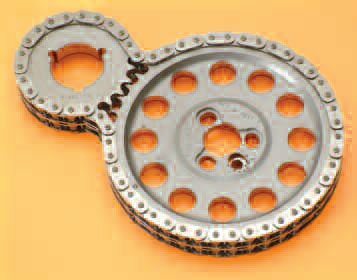 Even with 12 pounds or so less seat preload, the beehive spring gave better control, plus an additional 1,000 rpm to crash speed. 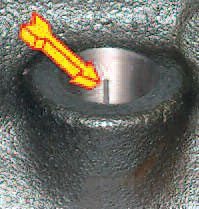 When building a flat-tappet engine, be sure the tappets are free to rotate in their bores and that you use the high-pressure break-in lube supplied with your cam by the cam company. Fail here, and your cam and tappets fail right along with you. 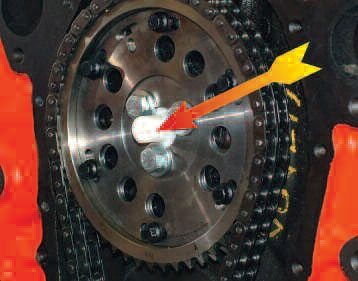 As mentioned earlier, a flat-tappet cam can have higher acceleration rates on initial opening and closing. Where it can fail is in terms of the maximum velocity that can be imparted to it. The maximum velocity is governed by the tappet diameter. The bigger the diameter, the greater the maximum velocity can be. The taper across the lobe width provides the means for vitally important rotation onto a flat-face tappet. Check this out: It should be about 0.001. If the cam has no taper, call your supplier and ask why not. The chances are you need the cam replaced. Money spent on quality tappets (lifters) is money well spent. These armored items are, when used as intended, virtually bullet proof and as such can go a half-million-plus miles. 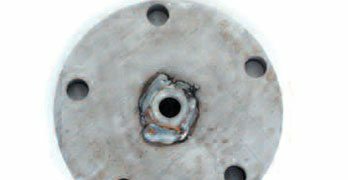 Supplying oil to the interface between cam and lifter is a good choice for increasing the reliability and life of the tappet and cam. 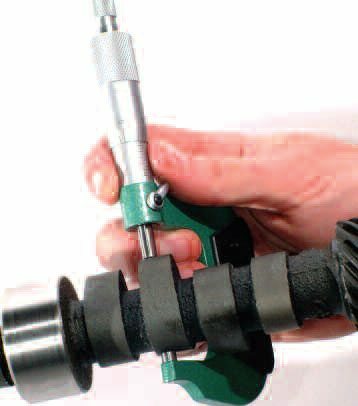 Comp Cams offer a lifter-bore grooving tool that spills oil from the lifter oil galley onto the face of the cam. The whole job is easily completed in 30 seconds, and it works well. 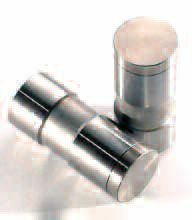 Also you can get solid tappets with a pin hole in the face to supply oil to the cam/tappet interface. This cam was installed with no heed to the guidelines offered in this chapter. It has less than an hour’s running time on it! The roller diameter and the cam’s base circle diameter limit the amount of the acceleration on a roller tappet. 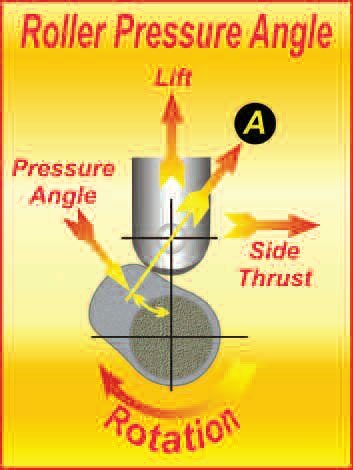 A pressure angle (arrow A) of about 28 degrees is normally considered about maximum but, if a short-duty life is all that is needed, this can go up to about 33 degrees. A roller cam’s acceleration is limited by the side thrust seen as the tappet is lifted. The size of the base circle and the pressure angle formed on opening is the controlling factor. The bigger the cam’s base circle, and the bigger the roller, the lower the pressure angle becomes, thus allowing an increase in initial acceleration. 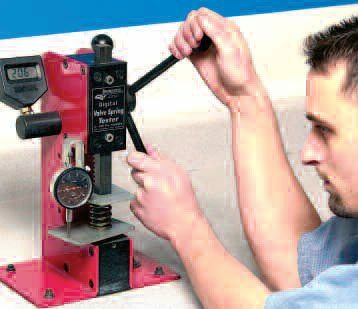 Where a roller tappet scores is that it is not restricted in the same manner as far as velocity goes, and much higher values can be achieved so long as the duration is sufficient to allow it. Solid rollers are intrinsically trouble free, so long as they are not overloaded, but the same cannot be said for hydraulic rollers. Distortion of the body from side loads appears to open up the internal clearances to the extent that they collapse all too easily. The extent that this can happen is far greater than is often supposed. While doing some Spintron work testing springs and hydraulic rollers, I found that OE rollers could collapse and reduce valve lift as much as 0.100! Timing-in the cam for a standard rebuild usually only involves aligning the timing dots on the gears. All too often, performance builds are done like this in the belief that this is close enough. 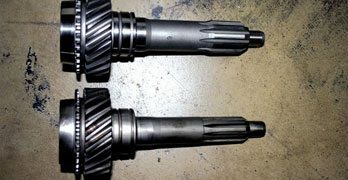 If you thought that this might be the case, see photo 11- 1, which shows just how far off the stock gears can be. Although I saved this set to show an extreme case, it is certainly not unusual to see the timing 2 to 3 degrees off what may be needed for best power. This style of roller tappet, with the horizontal spring-loaded link bar to prevent rotation (only available for small-block Chevy and from Lunati), has a significantly lower reciprocating mass than the conventional vertical link bar design. This Endurex solid-roller tappet from Comp Cams, for a big-block Chevy, represents a typical roller-design style with the vertical link bar. 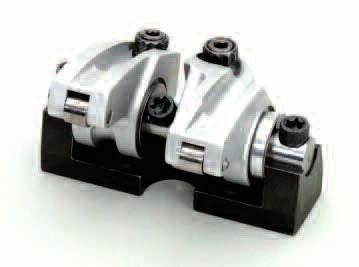 The billet body hydraulic Lunati rollers seen here are built to far closer tolerances than the OE rollers. 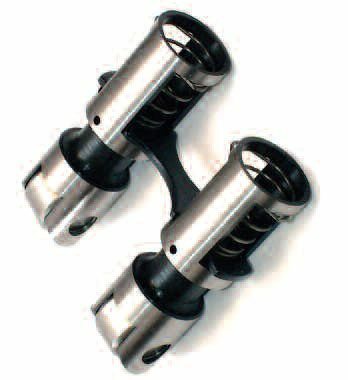 All too often, the use of OE-style hydraulic rollers with an aggressive cam profile can cost in excess of 50 hp; although more expensive, the fix is to use these Lunati rollers. The increased power potential more than justifies their extra cost. Any serious engine build should involve timing-in the cam accurately. This should happen twice; the first time during a dummy build to establish that, when the cam is where it is supposed to be, there is adequate valve-to-piston clearance. The second time should occur during final assembly. Most cam companies call for a minimum of 0.100, but that, to a large extent, is a failsafe deal. With the benefit of spin testing and the use of premium parts and profiles I have run valve-to-piston clearances as little as 0.016 on small-block Chevy engines turning upward of 8,000 rpm. Even the experts at the cam companies whose parts I used were somewhat in awe of the success with such close clearances. Back in my British Touring Car Championship era, I had the fastest car in the class, and the 10,500 rpm that my pushrod engines ran to still only had 0.030 intake-to-piston clearance. I am quoting those numbers just to make the point that spin testing can be a great advantage in optimizing the dynamics of the valvetrain. A great deal of emphasis is put on the timing of the cam into the engine. The more accurately the cam is spec’d-out, the greater the need is to do this. 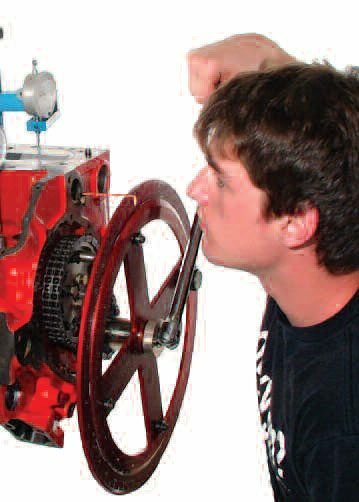 The intake lobe centerline method is the most common means of quoting the cam’s called-for timing into the engine. Without going into great detail as to why, this is by far the best technique to adopt. I also don’t intend to go into detail as to how this is achieved. If you buy any cam-degreeing kit from any cam manufacturer or go to their web site, you find a fully detailed description of how it is done. 11-1. From these timing marks, you can see that the cam would be timed a whole tooth out. On a nominally 300-hp V-8, that would cost as much as 50 hp. If a roller cam is being used in a block that was otherwise equipped with a flat-tappet design, there is often a need to control cam end float with a solid or roller thrust button (shown here). 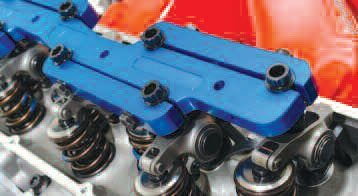 Although it may at first seem unrelated, the ability of the crank damper to damp-out torsional crank vibrations is key for a smoothrunning, problem-free valvetrain. Without a damper, crank vibrations are superimposed directly onto the cam’s motion. 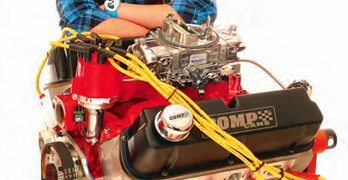 Here, race-winning engine-builder Dusty Kennett times-in the cam on this 8,000-rpm, small-block Chevy. Getting optimal results depends on knowing what they should be and what factors may affect where the cam is ultimately timed-in at. The question I am posing is: Are you aware of what the correct cam timing should be and why? Sure, you can just take the cam grinder’s word for it and maybe that should be your primary choice in the absence of any other concrete data. However, it won’t hurt to just discuss what factors may make the optimum cam timing other than that recommended by the cam manufacturer. Before we go any further, I should explain how advanced and retarded cam events are defined. If a cam is on, say, a 110-degree LCA, then, if it is timed-in with number-1 intake reaching full lift at 110 degrees after TDC on the inlet stroke, the cam is said to be timed “straight up.” That is, no advance or retard. If all the cam events happen earlier, the cam is advanced. The amount advance is defined as the LCA minus the intake centerline (that’s the point at which full lift occurs—ATDC.) Say we have a cam on a 108 LCA timed-in to 4 degrees of advance. This means the intake centerline is at 104 degrees. If it is retarded 4 degrees, it is at 112 degrees. 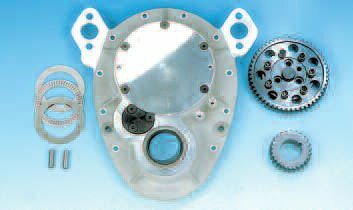 This split timing cover for a smallblock Chevy allows access to the cam to make timing changes without having to remove the crank damper and drop the sump. To make sure the cam timing is optimal, I make a great deal of use of adjustable cam timing sets. One of my favorites is this unit from Jesel. This particular example is for a smallblock Ford, but the company also makes them for several other popular Ford and Chevy engines. Adjustable cam drives, such as this unit from Cloyes, represent a costeffective means of adjusting timing in a relatively speedy manner, especially when used in conjunction with a split timing cover. Milodon is noted for its top-of-the-line gear drives. 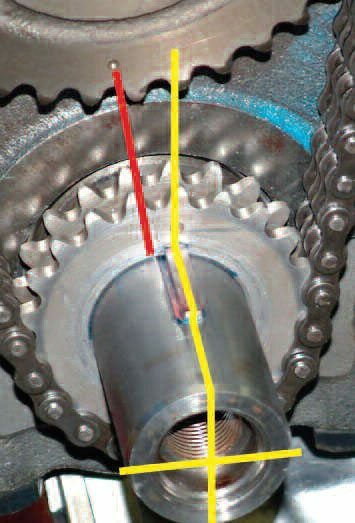 These feature all the timing and control assets of a belt drive but use gears instead of belts. Such systems are popular with alcohol burners and GMC-style blower applications. This rocker setup may look heavy and bulky, but appearances can be deceiving. In practice, this type of rocker made a very dynamically stable valvetrain able to impart almost 0.700 inch of lift up to speeds well in excess of 8,000 rpm. For many applications, such as two-valve pushrod V-8s, the cam manufacturer calls for 4 degrees of advance, and in most cases this works. But at the same time, it does make assumptions. For instance, let’s say the machine shop guy was brilliant at cutting intake seats that had considerably more low-lift flow than the normal three-angle valve job delivers. In this instance, the flow in relation to the piston and the exhaust valve appears to the cylinder as if the cam were too far advanced. For this to work best, the cam may need to be pulled back 2 degrees or more. Some of my own seat work produces low-lift flow equal to a valve of significantly bigger proportions, and as a result the cam has to be timed-in as much as 2 degrees retarded. The difference between the usually recommended 4 degrees advance and the optimal 2 degrees retarded, with my heads, is the difference between 575 hp and more than 600 hp. So accurately timing the cam, is worth the effort, but the only way to be absolutely sure it is optimal is to do the final setting on the dyno. One last point on the subject of cam timing: Why do better spec’d cams need to be timed more accurately? The answer is less than obvious. The principal reason is that if there is an error in the exhaust events one way, and an error in the intake the other way, we find that, as the cam is, say, advanced, the intake improves while the exhaust gets worse. The result is that the timing is not that fussy if one event is improved at the expense of the other. If the valve events were perfect, then any change in advance causes both the intake and exhaust event to get worse and makes power drop-off much faster. Now you know! 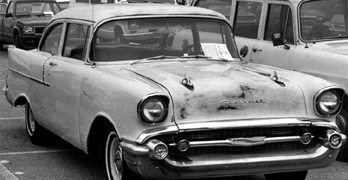 In this day and age, you might wonder why any engine has rockers, or even pushrods for that matter. 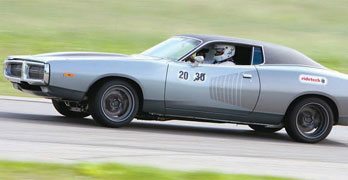 But the reality is that the American V-8 is still a dominant factor in the performance world. 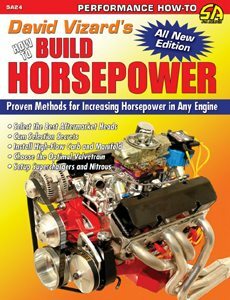 Its sheer size works for us—that and the fact that, over the past 50 years, the performance industry in the United States as a whole has become really good at finding horsepower. Add to this its basic simplicity and, as a result, we still have pushrods and rockers. the design of a rocker than meets the eye. As I alluded to previously, a rocker needs to not only amplify and transmit the required motion to the valve, but also damp-out highfrequency vibrations as far as possible. Although rockers made of steel can perform well, aluminum does have a moderate advantage here by being easy to machine. 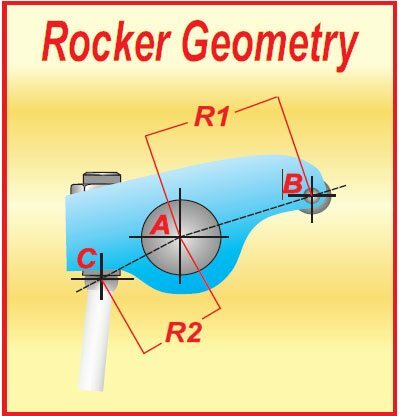 Rocker ratio geometry may look as simple as dividing R2 into R1, but there is much more to it than that. As the pushrod pickup point moves around in the direction of the green arrow, the initial opening ratio gets higher for a faster off-the-seat opening. That’s usually good for extra power. 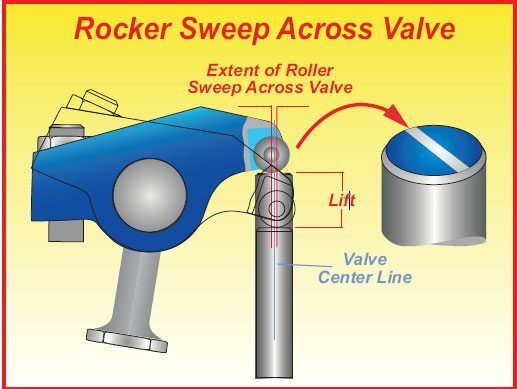 Pushrod length must be selected so that the sweep of the rocker across the tip of the valve is reasonably well centralized, as shown here. This rocker setup utilized a 1.75:1 ratio on the intake and 1.65 on the exhaust. A split of 0.1 of a ratio between intake and exhaust usually works because of lower exhaust-valve accelerations but, with a little more duration, have been shown to work well for high-rpm applications. By making the stem hollow, this Ferrea intake valve drops from 119 to 101 grams. 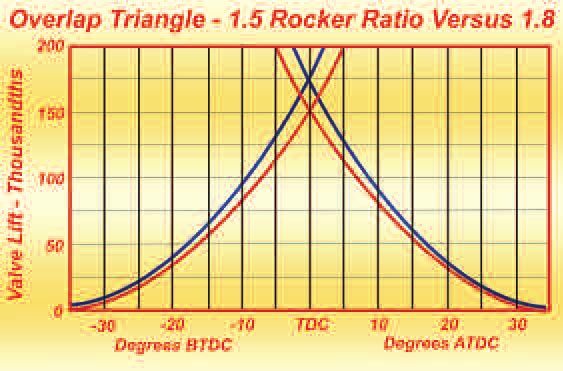 When testing to determine the results of an increase in rocker ratio, do not overlook that the overlap triangle is increased with the increase in ratio. To compensate, the LCA needs to be widened to truly establish what the higher ratio actually does for output. 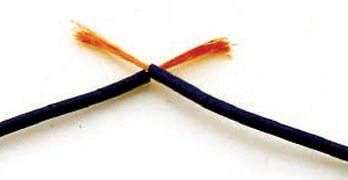 Polylocs in the lash adjuster have a habit of coming loose. 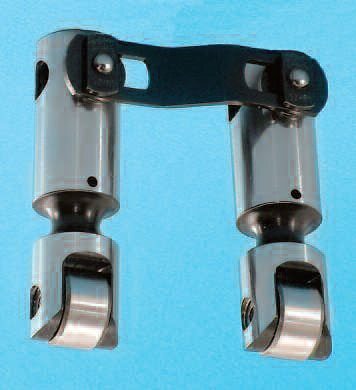 The use of a stud girdle on a stud-mounted rocker system not only prevents that but also provides added stabilization of the valvetrain. Having all the right components in the valvetrain is a good start, but the job does need to be finished by correctly lashing it. Here, a little fine tuning of the lash can possibly add just a few extra horses. Usually having the intake slightly looser than the exhaust works best, but the dyno provides the final proof. 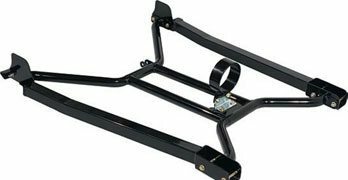 The first thing to consider when selecting rockers is the ratio needed for best results. Over the years, trialand-error testing of many rocker designs has led engineers to the conclusion that ratios between about 1.4 and 1.7:1 are effective and do not present any great manufacturing or design challenges. But the dyno shows that valve lifts in the region of 1 inch or more can pay off, and this has led to the development of ratios as high as 2.1:1. 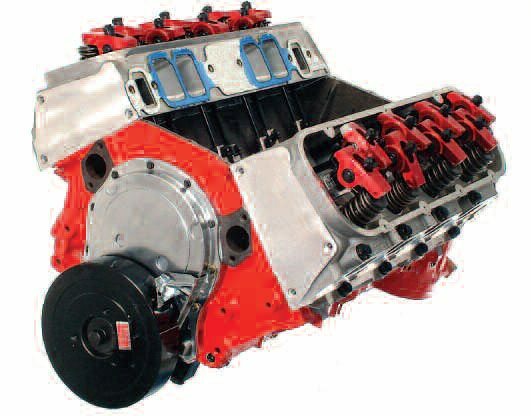 For a pushrod twovalve engine, we can reasonably say that the greater the rocker ratio, the higher the power potential. But anything exceeding about 1.8:1 starts to get a little fussy in the way of the hardware to support such a ratio. 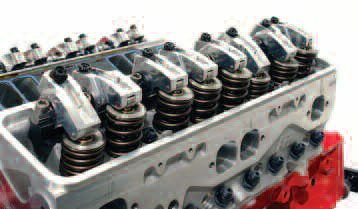 Everything in the valvetrain such as pushrods, springs, valve mass, tappets, etc., starts to demand significantly higher sophistication. Saving weight in the valvetrain is worthwhile, especially at the valve. A titanium retainer instead of a steel one is typically worth 100 rpm in a pushrod valvetrain. Hollow-stem valves like those from Ferrea are more than halfway to a titanium valve, but at less than half the cost.